butterfly! i was reading my guidebook trying to decide what to do next because i couldn't go to the blue mosque since it was closed for prayer. 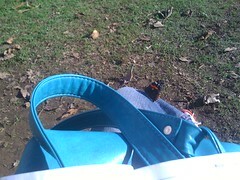 and this guy landed on my leg and stayed for a long time.